The venue of the meeting is located on walking distance from the Hotel Rebro through the Park Maksimir. The distance is approximately 2,5 km. The route can be seen on the map below. The bus station of the line 228 is located next to the Hotel Rebro. It takes 5 minute to the tram station on Maksimirska street where you can take tram 4, 5, 7, 11 or 12 to the Faculty or can go on foot. 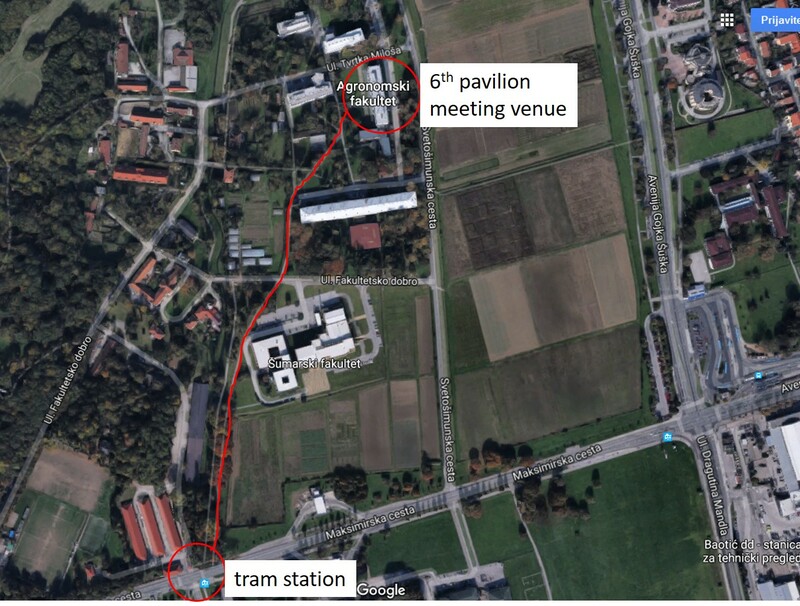 If you take tram the station is next to the stadium (Bukovačka) and the exit station is Ravnice where you have to cross the road and walk on foot (app. 10 min) to the venue. Hotel Residence is located on walking distance (app.2,5 km) from the Faculty and it takes approximately 20 min. Tram stations of lines 4 and 11 are located next to the Hotel Residence (Kapucinska or Ljubijska) and the exit station is Ravnice. Next to the exit station is path to the Faculty of Agriculture and it takes app. 10 minutes on foot.